I’m completely addicted to making these little baby booties. 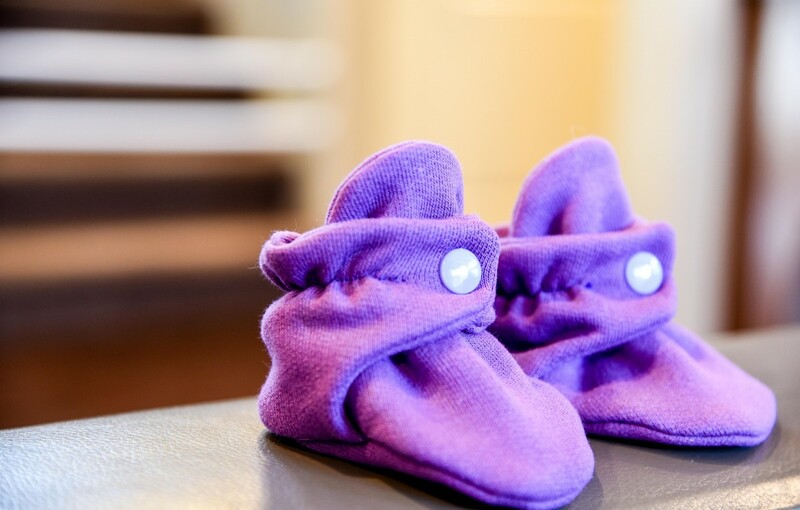 As I mentioned in my previous post – they are the perfect little foot covering for newborns and infants. They don’t fall off like socks do (and in turn don’t get chewed on by the bassets) and they keep those little toesies nice and toasty warm. A friend bought me a pair of these as a baby gift and I just couldn’t get enough of them! They are a little hard to find up here in Canada (and when I can find them, shipping is very spendy) so I decided to look around and see if I could find a pattern. This blog here had the perfect tutorial! I was able to follow along with the video but if you need more step-by-step instructions, you can also purchase the pattern. The size featured on the blog ended up being a bit too big for Elliana so I reduced the pattern to 80%, reprinted all the pieces and voila!! A perfect little bootie for my almost three month old. So far I’ve made three pairs but if you know me at all, you know there will be more! I mean, – this blog is called Will Cook for Shoes so you know my daughter has to have a good shoe collection! Any suggestions on where to get good quality jersey knit? What were/are your must haves for a baby? You know, those little tips and tricks that you couldn’t live without?